It was one of those slow motion moments. I lift the ladder, the white blur of the quart descends downward, I hear the dull thud, and watch as the spray of fresh “Baize Green” showers my office in rain of latex. Noooooooooooooo! I’m not going to cry, I’m not going to cry… I’m going to bite my lip, and take a deep, long breath. Sigh…….. The hard wood floor has a pool of paint on it, soaking into the cracks. Lovely. The walls and board and batten look like Jackson Pollock just paid the room a visit. Fabulous. Paint is all over my junk pile on the floor, which includes some tax files. Kick my self…. I knew I should have picked up those items! The carpet and computer chair are beyond saving, because my focus needs to be on cleaning up the flooring. Great. I run my hand through my hair, just staring at the disaster. What the??? Paint is now all over my hand and arm and hair. I look up to see the drips coming down from the ceiling. HAHa! At this point I just laugh. Because what else am I going to do? I’m not going to cry over spilled paint. Yesterday I posted a pic of the spill on my Facebook and Instagram and many of you asked how was I going to clean up the latex paint. I ran to the kitchen and grabbed a few items, a big bowl of water, a metal dough scraper I use when making bread, a rubber spatula, and a sponge. The first thing to do was to scrape up as much paint as possible. So I used the rubber spatula to scoop paint onto the dough scraper, then poured that back into the paint quart. The rubber scraper worked great. Then came time to wash it all. This took a long time. 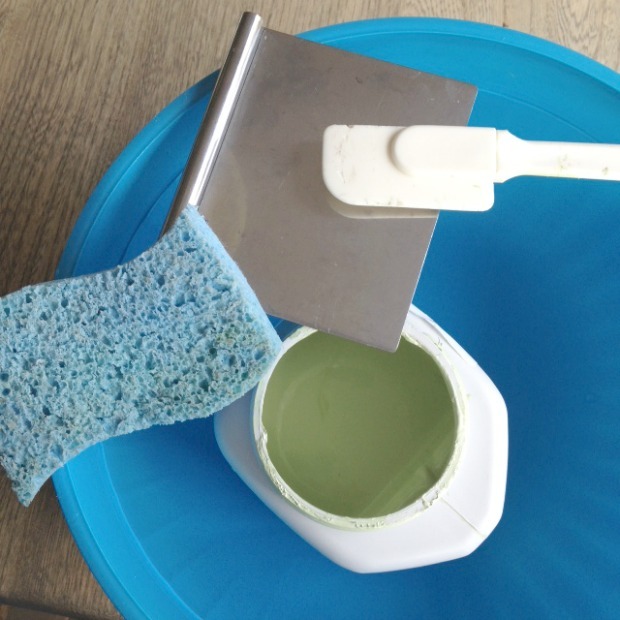 I used warm water and worked in small areas, scrubbing off any paint that started to dry with the rough side of the sponge. I think I changed the bowl water at least 8 times. Sadly the chair and rug were causalities. I planned on getting a new run anyhow. This is what my office looked like before. 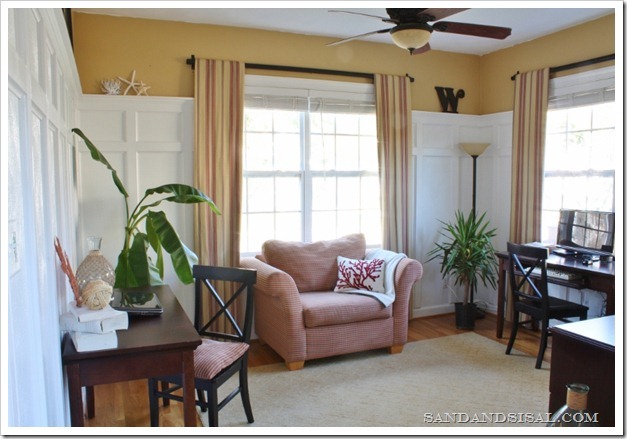 We installed the board and batten (click link for full tutorial) about 2 years ago and I love it. The gold color on the walls is Blonde by Sherwin Williams. I wanted a fresh change in the office and these table linens from the Threshold line at Target were the inspiration for the new office makeover and paint color! I have the table runner on my kitchen table and I love it. We have a very open floor plan on the first level and the office is open and is adjoined to the dining area of the kitchen. The entire kitchen and family room are painted in Comfort Gray (click the link to see the kitchen). 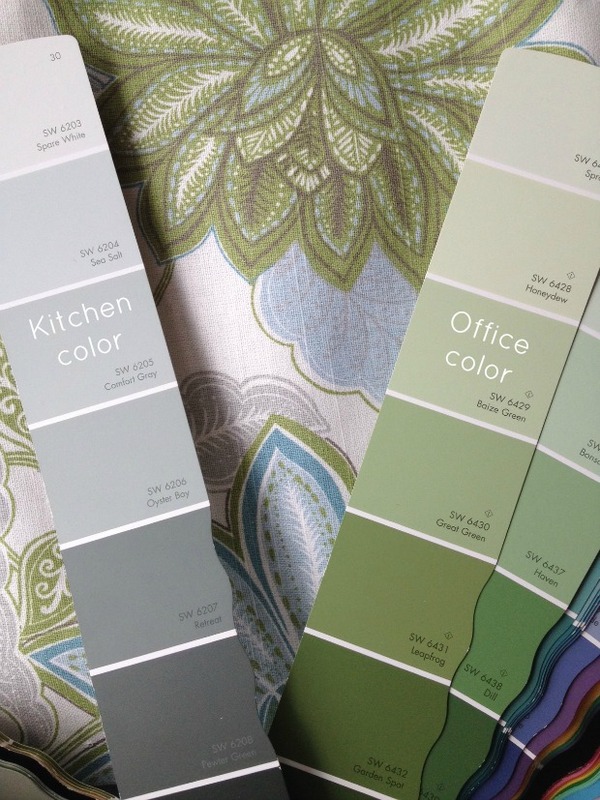 Baize Green is in the same family group as Comfort Gray on the Sherwin Williams color fan and they are both the same depth of hue, which means they will coordinate beautifully together. 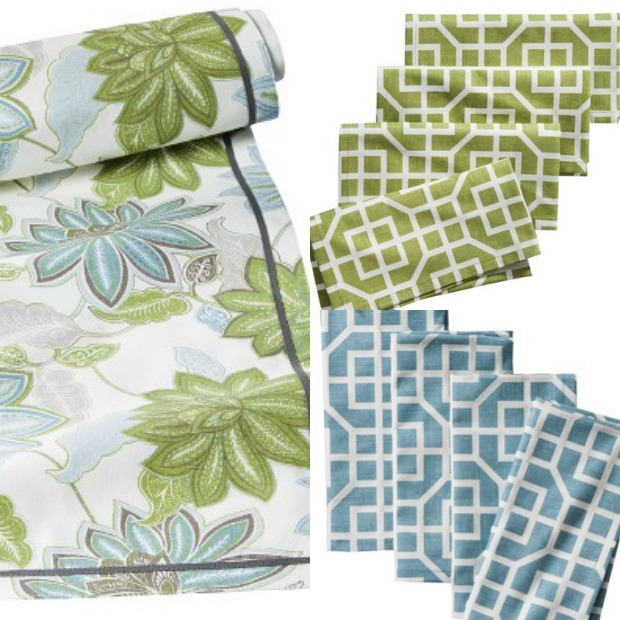 I’ve ordered several of the linens and have big plans to use them in the office in creative ways! I can not wait to show you the office when it’s finished! Every DIY project comes with its ups and down, successes and failures and none of us are immune to the occasional screw up. We just need to keep a positive attitude, and perspective knowing that these things are just material items and can always be repaired, and if not, then replaced. So I will not cry over spilled paint, but slow down a bit, and definitely think before I move a ladder next time! I’m off to the store now to get more paint! Have a fabulous day! Oh no! I’m so sorry. Ugh. For me, EVERY DIY project has at least one moment like this. I like to call it “the glitch” and have just come to anticipate it. Good for you for not crying :). Can’t wait to see the finished office! I’m sure it’s going to be gorgeous when it’s complete! Especially with a new chair and rug in the mix 😉 Jim once spilled an entire gallon of paint on our carpet. Oops. Glad you got it up off the floors, you’re right, that was the priority for sure. Such a pretty wall color you picked, look forward to seeing the reveal, I always love your rooms. Oh.. I think I would have cried! I love your color choices!!! Can’t wait to see it all put together. Yipe!!! Great save!! I would have lost it – but laughing at yourself is really the best medicine 😉 definitely keeps your blood pressure in check! Good for you! Love the new idea of using the table linens – can’t wait to see how it turns out! lol- I have done this, more than once I am sorry to say! Isn’t it amazing that the very same latex paint that won’t adhere to some prepped surfaces becomes instant mega-glue when it’s spilled on something?!? Well, at least you were doing it over anyway. Love the color! Oh holy cow! That is an awful moment when that happens! It always happens around things you just looked at and thought, “I should move that” or “I’m going to be sorry if I don’t cover this” which just makes the whole thing more painful. SO glad it wasn’t a new, beloved rug! Pretty color…maybe not so much on the items it wasn’t intended for though. I’ve seen many people out and about the WWW who paint fabric chairs all the time…maybe you can salvage the chair if you try. Hi Doris! Yes, I will try to salvage the chair, either by recovering it and maybe painting the arms and legs??? We’ll see. Oh, don’t throw the chair out…nor the rug. Paint them! Have you seen that adorable loveseat on which the upholstery was painted on the Trois Petites Filles blog? Oh my. This made me laugh out loud. But I feel your pain. The exact same thing happened when I was painting the trim in our breakfast room. I can still see the paint that dried in between the hardwood flooring back there! I love the colors you have chosen. So pretty! Girl, you handled that spill a LOT better than I would have! No fun for sure, but I can’t wait to see the changes in the room. I feel your pain! 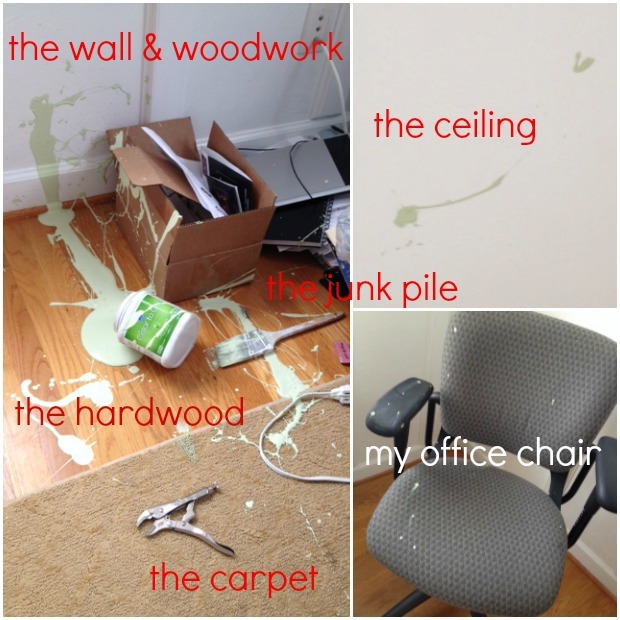 I came home one day to my husband trying to clean up a gallon of paint he spilled on the second level wood floor stairs! I just laughed and took a picture for future reference! Love your new colors! Thanks Nancy! Yes, I painted the family room Comfort Gray also since all the rooms are joined. In Your Eyes…. what an awesome name for a paint color! Now I’ll be singing that song all afternoon and envisioning John Cusack outside my window! Ha!